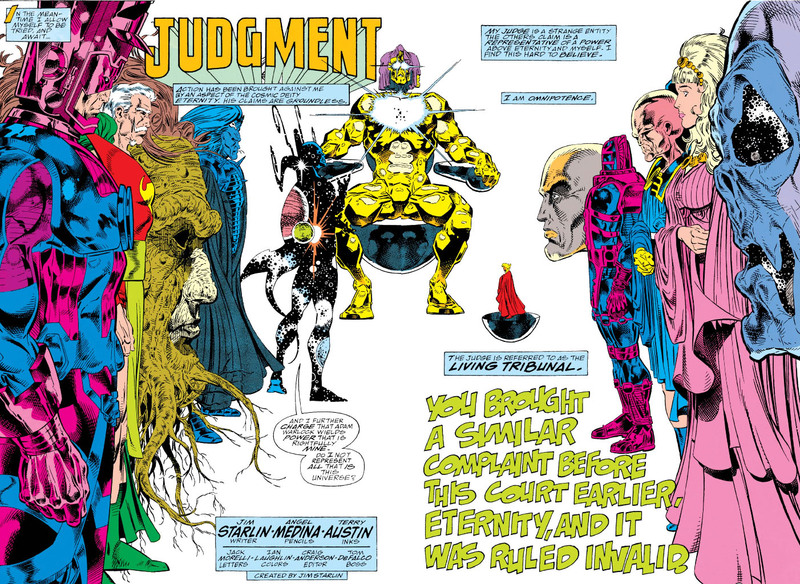 Recently we were witness to a hearing requested by the entity known as Eternity and officiated by the Living Tribunal, to assess the fitness of Adam Warlock to retain possession of the all-powerful Infinity gauntlet--a distinctive glove embedded with gems which give their bearer mastery over the mind, space, reality, time, power, and the soul. With the help of his allies, Warlock prevailed over the villain who wore the gauntlet, Thanos of Titan, and subsequently took possession of it for himself, declaring that he would use its power wisely. Warlock considered the proceedings little more than effrontery, but nevertheless felt compelled to see the hearing through to its end. Unfortunately, Eternity's profile on Warlock was damaging enough to cause the Tribunal to rule against him; and since resistance on his part would likely lay waste to all of reality (which seems ridiculous, since one of the gems gives Warlock control over reality--but what do I know), Warlock agreed to relinquish five of the gems and distribute them to five individuals who would serve as their guardians. 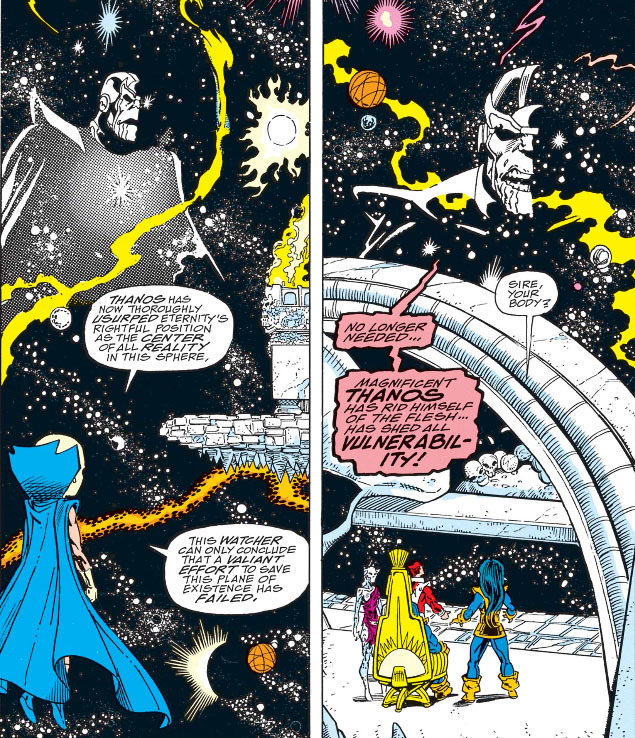 The outcome of the hearing was the best that Eternity could hope for, under the circumstances--though since Eternity's case against Warlock was based on his mental instability, one could admittedly question the wisdom of allowing Warlock to choose the gems' custodians. But the compromise is struck, and Warlock departs to see to his task. 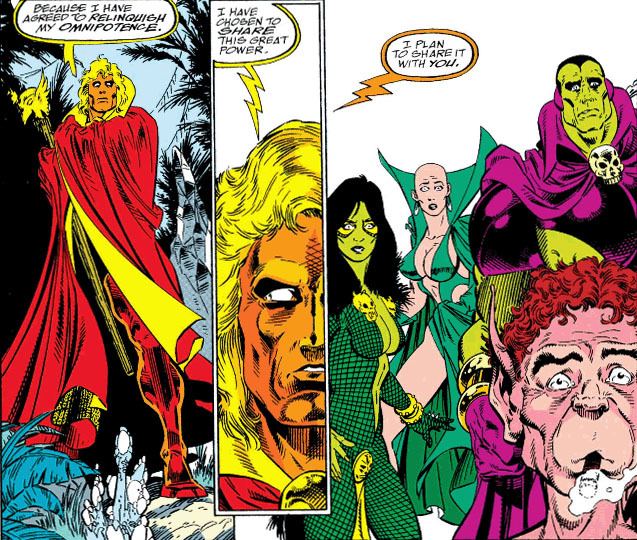 Yet Warlock's eventual choices as to which individuals will each receive one of the Infinity gems are questionable, to say the least--a collection of misfits that might have us wondering if Eternity's concerns about Warlock's stability shouldn't have been taken more seriously. It's a great feeling to escape universal armageddon, isn't it? Following the events of The Infinity Gauntlet, all of us on planet Earth are probably breathing a sigh of relief that, thanks to the efforts of a select few, we survived the crisis intact--or, rather, we would be releasing that sigh, if we recalled that crisis ever taking place. 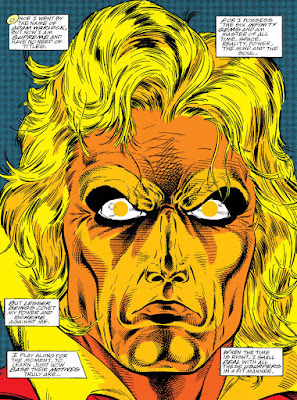 But for Adam Warlock, sole holder of the gauntlet where the six all-powerful infinity gems are embedded, there is no relief from either the responsibility he feels to shepherd the fate of the universe, or from the scrutiny of those who have gathered under the judicial gaze of the Living Tribunal to pass judgment on him for the course he has decided to set for himself. ...since, as far as Warlock is concerned, he has no peers. On the heels of the PPC's look at The Infinity Gauntlet, where first a coalition of super-beings of Earth fell to the power of Thanos, followed by his defeat of some of the mightiest entities of the cosmos, it appeared that Thanos considered himself triumphant, having bested no less than the being known as Eternity and adopting that status for himself. The physical and now vacant form of Thanos that remains seated on the shrine to Death that served as his floating base in the void is flanked by those who have watched his literal ascendance to power: Eros, his brother, rendered mute; Terraxia, totally devoted to Thanos, created from thin air by the power of the gauntlet in response to Death spurning him; and Nebula, his supposed granddaughter, made to serve as another tribute to Death--transformed from a healthy, vigorous woman to a walking corpse, nearly mindless and in constant agony. "Triumphant" is admittedly an assessment that's hard to argue for Thanos at this point. But if that's so, then how do we explain the series' climactic sixth and final cover? It seems that Nebula's fortunes have changed. 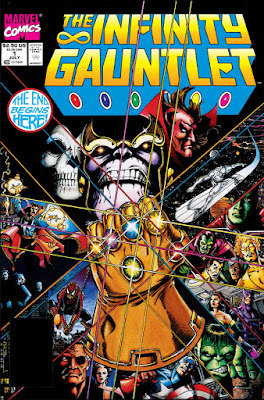 The Infinity Gauntlet, a six-issue series from mid-1991, was the main event in a crossover of comics titles coordinated to return the evil Thanos of Titan to the land of the living after an absence of over a decade. At first glance, the gauntlet represents another grab at ultimate power by Thanos, who has already failed once in such an attempt and whose follow-up scheme, though less in scope (if you can call committing "stellar genocide" by destroying all the stars in the universe a downgrade), eventually led to his death at the searing hands of Warlock. And by the time this new series reaches its end, it acknowledges and virtually sets in stone the underlying reason for why such power plays fail, in both the past and the future: that Thanos subconsciously supplies the means to his own defeat because he knows that he isn't worthy of such power. While that may be a handy rationale to call on when Thanos's scheme du jour has played itself out and it's time for the hero(es) to triumph, it doesn't really suit this being who has been made to be so ruthless and murderous. One doesn't usually go to such lengths to attain ultimate power, only to toss in the towel after achieving it. As a result, arguably only two things of significance occur in this series. As far as the primary conflict, Nebula--the granddaughter of Thanos* who's certainly power-hungry in her own right--turns the tables on Thanos and emerges as the main threat. But in addition, Warlock as well is brought back from the dead (but not quite dead), groomed to make the transition to his own series on the heels of this one, a series based on the Infinity Gems. Dealt in as window dressing are not only a host of Marvel characters gathered to lead the charge against Thanos, but also a number of prominent universal abstract entities and cosmic beings that naturally rate an issue of their own to confront and battle the Titan. 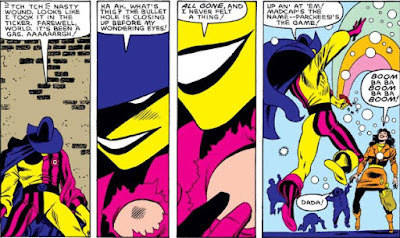 Present also is the silent but (appropriately) deadly personification of Death, again a fixture in the motivations of Thanos. *Let's not take the time to examine that family tree for now--but we'll take a crack at it one of these days! The Silver Surfer warns Dr. Strange of the return of Thanos, due to Death having done a little arithmetic and determining that a cosmic imbalance exists because a greater ratio of people now alive exists over those who have ever died. Thanos immediately comes to mind for Death as a way to correct the imbalance, given his tendency and proficiency to cause mass destruction and (say it with me) death. 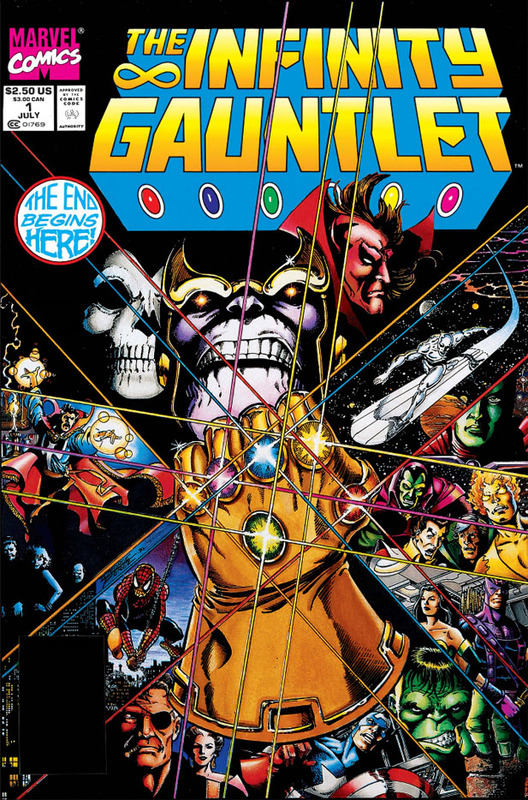 Thanos learns of the existence of the Infinity Gems and convinces Death that he cannot accomplish his task without them. Seizing them one by one, he attaches them all to a gauntlet, giving him mastery over... well, they're not called "infinity" gems for nothing. Together, they represent overwhelming might for the one who uses them. In a conflict with the Surfer and Drax the Destroyer, Thanos uses the soul gem to steal their souls and thus banish them to that gem's "world," where Warlock now resides. Warlock is able to eventually return them to their own reality. Mephisto (he does seem to have his hands in everything, doesn't he?) warns the Surfer of Thanos's plans, but also takes a position as Thanos's informal advisor. Meanwhile, the Surfer heads to Earth to alert Dr. Strange to the crisis. Thanos, in his acquisition of the gems, finds that he has alienated Death, since the Infinity gauntlet he insisted on creating to harness the gems' might makes him her superior. On the other hand, he's now motivated to carry out the mass deaths tasked to him as a way to win back her favor. Warlock and his friends, Gamora and Pip the troll, emerge from the soul world by appropriating and adapting human bodies recently involved in a fatal accident. 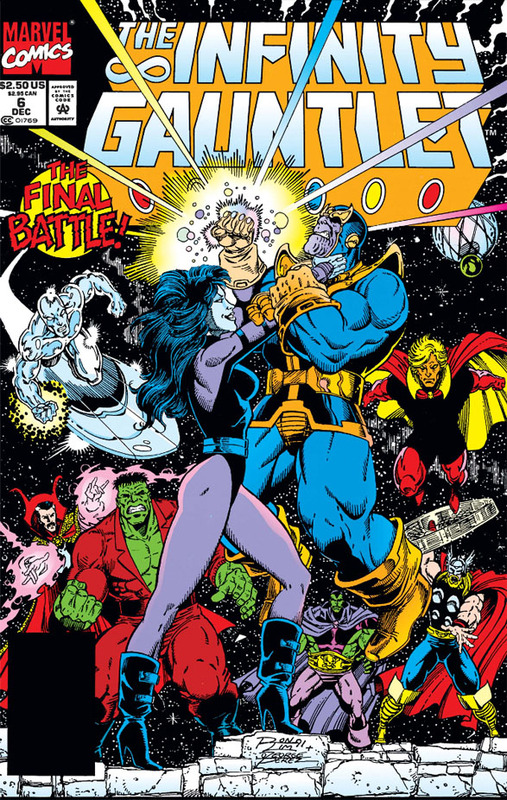 Once the ball gets rolling by the call to arms by Warlock and everyone getting briefed on Thanos's plans--and with the first salvo being fired by Thanos that fulfills his pact with Death, eliminating half the galaxy's population--the series reaches the point of presenting two battle-packed issues featuring those who would stop him. 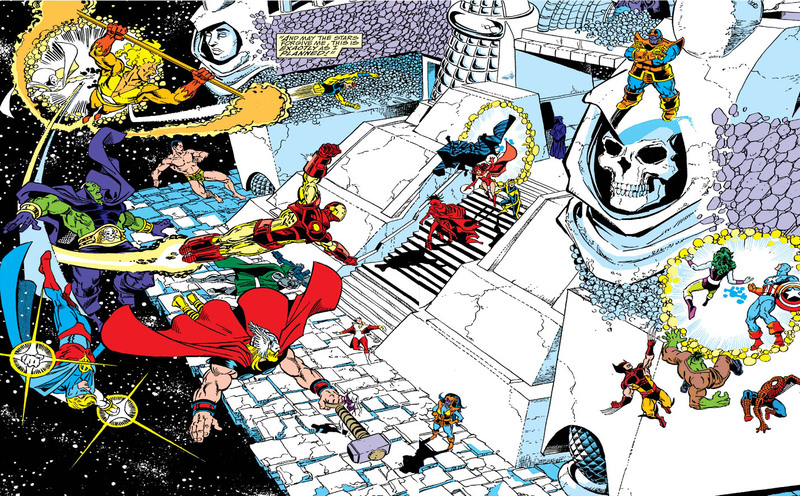 The main event for readers of various Marvel titles, however, is probably the story where the super-powered beings that Warlock has called together arrive at the citadel in space that Thanos has created as a shrine to Death, part of a plan that will most likely see them meet their end. God Of Thunder No More! 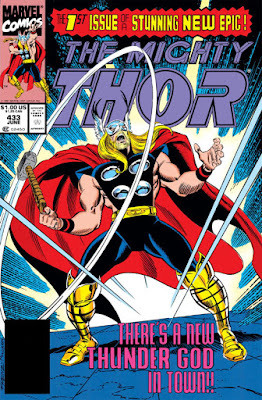 Having already witnessed the shocking scene where the mighty Thor committed the unpardonable sin of slaying his evil half-brother, Loki--an act which caused Thor to be summarily banished for all time--it's time to follow up on that story and not only discover the fate of Thor but also the many hidden truths which writer Tom DeFalco would reveal, one by one, which allowed the mortal Eric Masterson to assume the identity (and comic book) of the Thunder God for the next 25 issues. 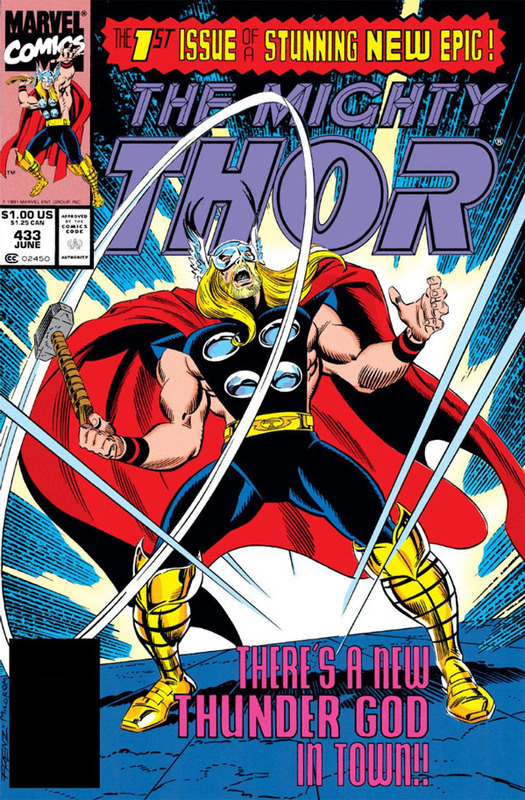 As we can see, artist Ron Frenz has given a sense of symmetry to the cycle, commemorating the points at which the "new" Thor made the scene and when the original Thor would reclaim the book. 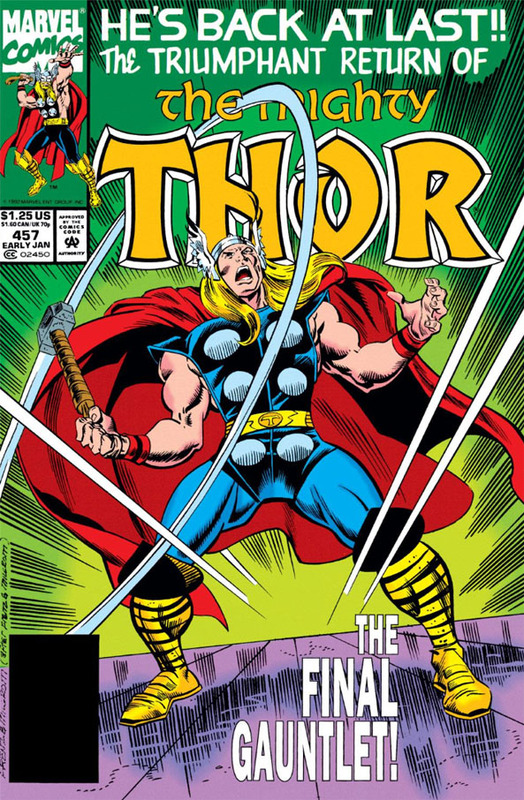 It was a generous two-year period which allowed a brand-new and more mortal point of view of the God of Thunder to play out, though there were likely more than a few readers who may have been drumming their fingers on a hard surface while waiting for this storyline to run its course. And run on it did, stringing along fans of the original Thor with one red herring after another that might reveal Thor's true fate and thus would give the impression of the book circling back to restore the character. 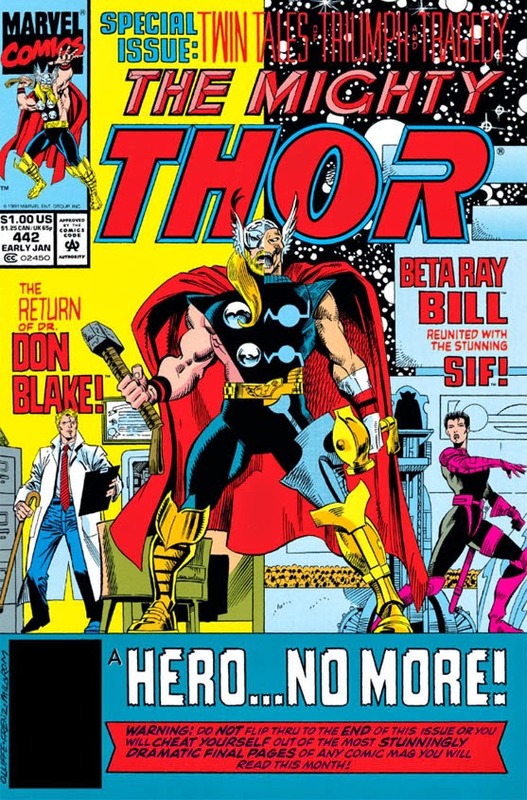 In the meantime, DeFalco was pursuing an intriguing (if at times interminable) story where an ordinary human suddenly found himself to be, for all intents and purposes, Thor--someone whom the average reader could hopefully identify with and get behind. 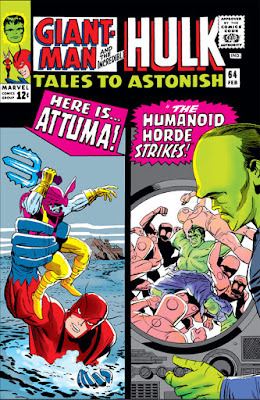 The flip side of that coin was that the character no longer carried the sense of grandeur and nobility of the original--no longer set apart from the likes of Spider-Man or the Avengers or Daredevil or other human super-heroes on the comics shelves, regardless of how many Asgardians DeFalco would pack his stories with to compensate. If you'd prefer to take each of these issues in turn and follow DeFalco's intentions for portraying Masterson as well as the many diversions that teased the possible return of the true Thunder God, that's certainly a valid and perhaps even rewarding option available to you; and of course now you wouldn't have to spend nearly as much time doing so or waiting a month between issues. But for those of you who want the answer without reading through twenty-five issues of preamble, or for those who have already read the entire story when it was published but just want to refresh your memories, the PPC promised earlier to cut to the chase and put it all together for you, and we aim to please. Speak for yourself, Odin! Some of us non-immortals aged two years to finally get this info! 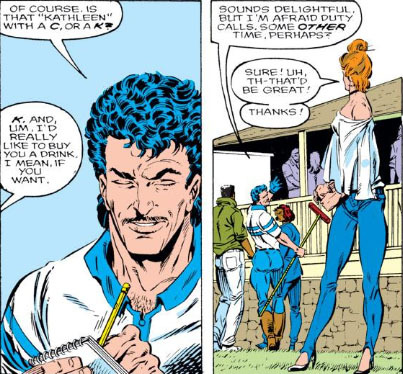 If we were looking for a likely cause of the trend that began in Invincible Iron Man in the '90s to hamper Tony Stark with a variety of debilitating physical afflictions that ranged from putting him in a wheelchair to his nervous system being compromised to rebooting his brain like a hard drive, we'd have to turn our gaze to Kathy Dare, his psychotic stalker (or is that redundant?) who caught his eye at a polo match and went on to insinuate herself into his life--clinging to him like Saran wrap, while just as suffocating. 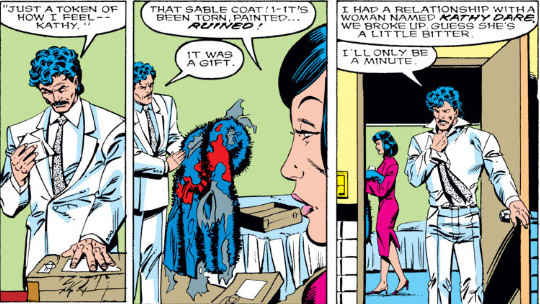 How did Tony Stark become the victim of Kathy Dare? 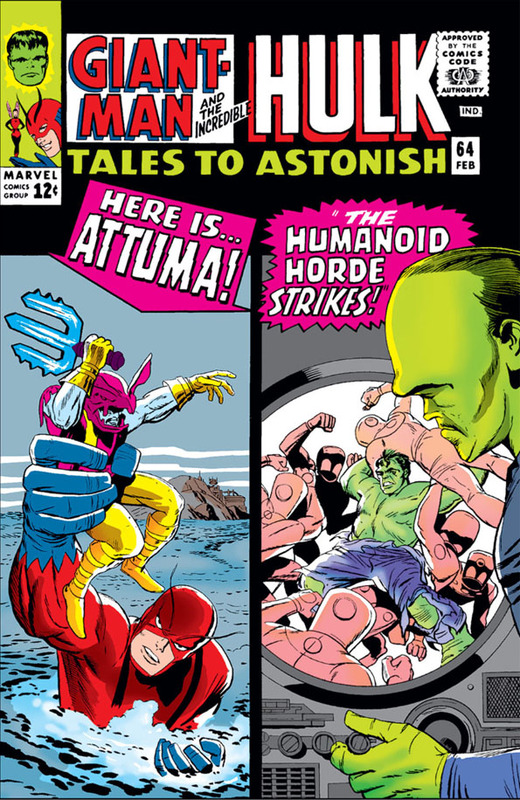 In previously taking a brief look at a couple of Harlan Ellison plots that writer Roy Thomas had adapted and scripted to feature in The Avengers, we touched on one which many of you might recall from mid-1971--a two-part story that began in The Avengers and concluded in The Incredible Hulk. 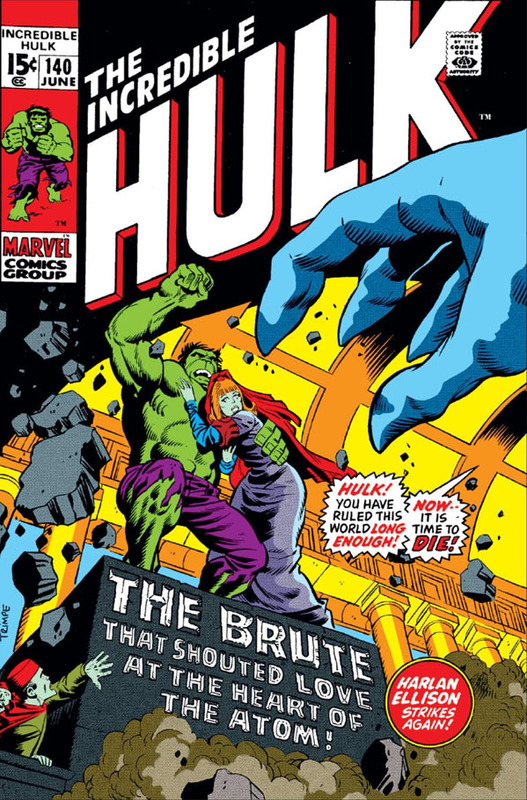 It's a pleasure to revisit that tale and give it the full PPC treatment--each segment a fine read in its own right, with Thomas tailoring the main thread of Ellison's plot to the different styles of both titles and using the Hulk to bind the two together. 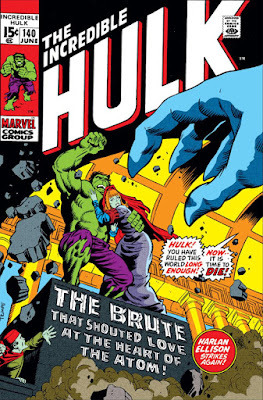 It would be the fate of the Hulk at the end of Part 1 that cuts loose the Avengers portion of the story and allows Part 2 to proceed on its own--a transition that doesn't quite bear up to scrutiny, though we'll get to that shortly. The investigation of a missing person leads to a voodoo ceremony in a Louisiana bayou which prepares to sacrifice a human life to the Dark Gods--beings who were worshipped eons ago by a technologically-advanced insect-like race that lived beneath the Earth's surface. At some point, that race offended their gods and were put into a hibernated state; yet one of them is eventually awakened in our century and instructed to secure a living source of power for the dark ones to feed off of. Once these gods were sated, they would in turn awaken the rest of the insect race, who would then take over the world they'd inherited. In essence, the entire human race is in danger. The missing person is discovered to be among those involved in the voodoo ceremony, in a trance state--and in his delirium, he spouts latitude and longitude coordinates that lead to an atoll in the Pacific, where an ancient image is found that resembles the mask of the voodoo priest from the bayou. The investigation leads to the lair beneath the Earth where the lone member of the insect race has secured and is preparing the living power source that will feed his masters. Before he can proceed, he's discovered and his plans foiled--and in their anger, the Dark Gods turn on him. It's unclear whether or not Ellison had injected any of Thomas's characters in his story proposal, though it's likely since the plot as it stands isn't enough to justify the page count that Thomas received from him. At any rate, we can reasonably plug in the players here, at least some of them. The living power source that will feed the Dark Gods would be the Hulk; the ones who investigate and eventually confront their servant are the Avengers. Things begin when Captain America, as a favor to the Falcon, helps him look into the disappearance of a friend who has failed to arrive for a scheduled visit--and the leads they follow take them into the bayou and subsequently have them breaking up a voodoo ceremony where they find Ralph (the Falcon's friend) in a mindless state but pointing the way to another part of this mystery. At that point, Cap deals in the Avengers. But how does the Hulk become a pawn in this drama? 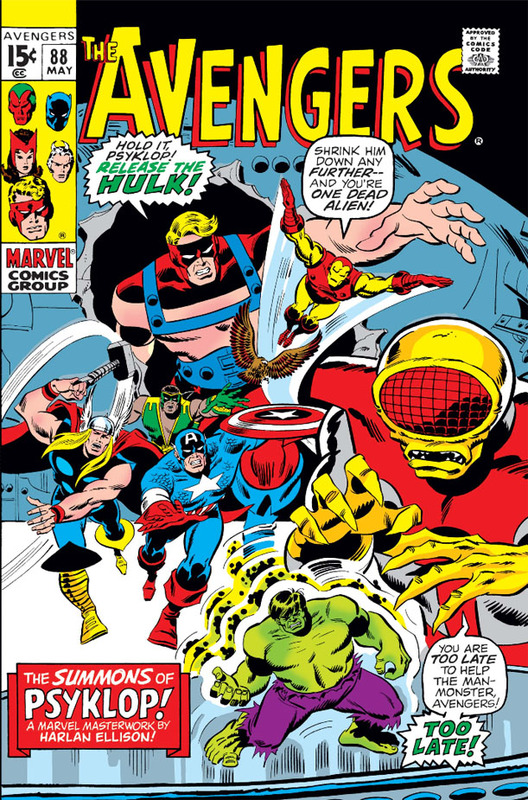 To get the ball rolling, it seems a few prominent figures have put their heads together to capture the brute and finally begin working on a way to end Bruce Banner's nightmare forever--providing nothing goes wrong, that is. Since we began our look at Marvel's composite cover images released during the period from 1981 to 1992 with artist Bob Layton's cover to Invincible Iron Man #144, it seemed only fitting that we finish up with issue #244, published eight years and exactly 100 issues later. 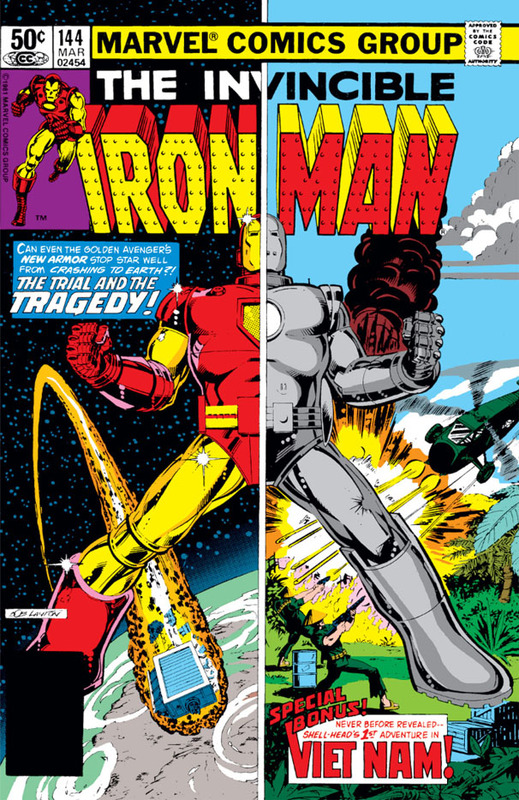 It's Layton who brings us full circle, once again rendering the cover but also handling both pencils and inks in an oversized 48-page story that will again provide brand new material from Iron Man's earliest days in his gray armor, though for different reasons. In that prior issue, Stark had been musing about his first meeting with the man who would become his friend and chief aviation engineer, Jim Rhodes, forming a bond under fire in the jungles of southeast Asia that would see them through the evolution of both Stark Enterprises and Iron Man. This time, Layton and writer David Michelinie (with whom Layton shares plot credit) have given Stark good reason for returning his thoughts to those early days--a reason which you and I would probably best label as "therapy." Unfortunately, Stark is very much in need of therapy, both physical and mental. As this story opens, Stark is beginning the recovery process from a near-fatal attempt on his life by Kathy Dare, a former girlfriend who ranks right up there with Alex Forrest in both an unbalanced mind and vengeful behavior. (In fact, Kathy could probably teach Alex a thing or two about payback.) Arriving home, Stark was surprised in the darkness of his home by Dare and was shot, the bullet severely wounding him and lodging near his spine. The bullet was removed in surgery--but its passage caused irreparable damage to vital nerve tissue along the spinal column, rendering Stark permanently unable to walk. Dare was taken into police custody--but the damage, as they say, was done. 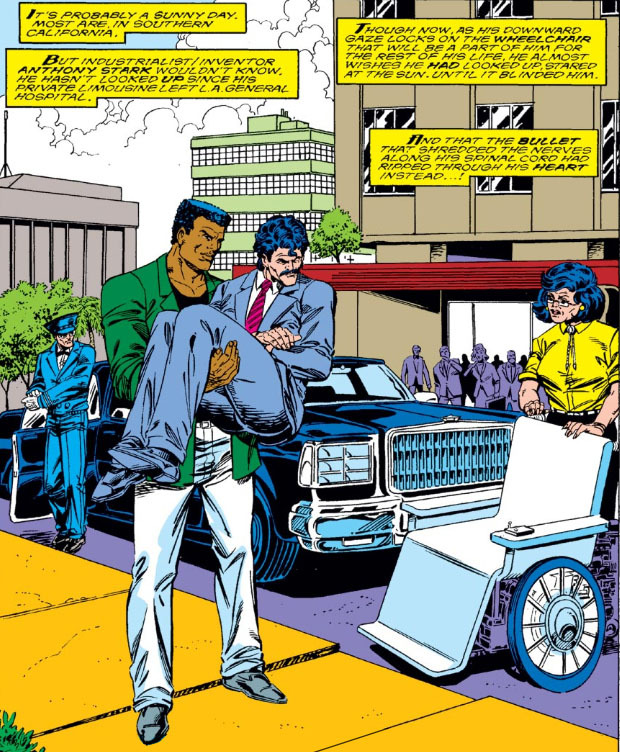 And so Stark, now a paraplegic, must pick up the pieces of his life and resume his work as head of Stark Enterprises, while his career as Iron Man seems to be a thing of the past. 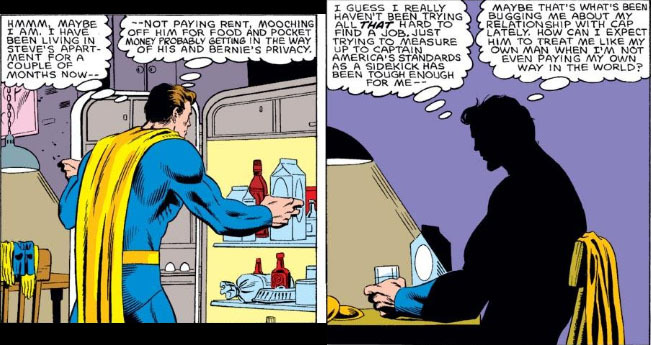 Michelinie and Layton have taken an intriguing turn with the character, given Stark's hands-on management style in regard to both his business and his personal life, to say nothing of his years as a heroic figure; now he must pivot and begin living his life in an entirely different way, just as any person would under these circumstances. As with his alcoholism and the prior loss of his company, Stark is faced with another situation where he must pull himself up and muster the resolve to go on rather than descend into bitterness or depression. The parallels to his experience in Vietnam--another instance where his life took a turn for the worse and forced him to re-evaluate how he would go on--are clear; indeed, the story would make strong use of that incident in determining if and how Stark will cope, as we'll see. For now, however, we must--as Stark must--begin at the beginning of this process which, for Stark, means leaving the hospital and facing the fact that he's unable to do so under his own power. Thanks to Michelinie and Layton, it makes for an unforgettable page one, giving Stark a blunt picture of how his life would be from this point on. In this issue of Mighty Thor that displays a cover image of two Gods of Thunder, would you feel gypped if it turned out that neither of them was... Thor?? 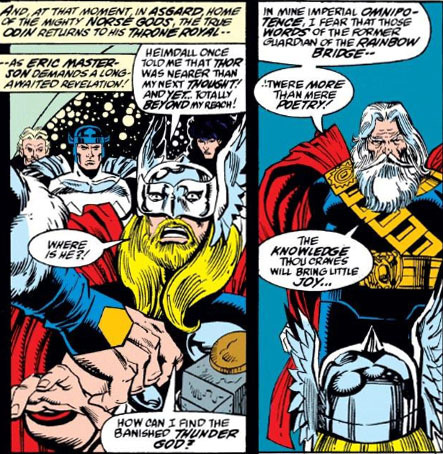 Or that Thor--the son of Odin, that is--isn't present in even one of this issue's stories? We've been looking this week at issues from 1981-'92 that have covers with a composite format such as this one, indicating that each of the (half-)characters pictured has a part to play in the story inside. 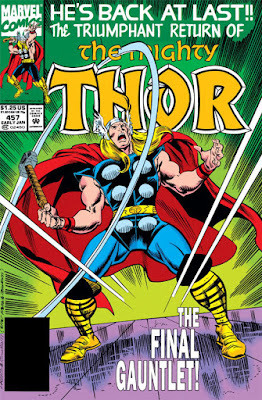 From a glance at this cover, those characters will be Eric Masterson, who's taken on the role of the Thunder God in the absence of the true Thor, and Beta Ray Bill, the alien who was granted by Odin the power of a Thunder God as well as his own enchanted hammer. But what about Dr. Don Blake, who's also pictured here? Doesn't he count as the real Thor? Ay, there's the rub. * You'll have to wait a bit for that question to be addressed; to give you an answer now would spoil the big reveal. Let's just say that you shouldn't read too much into the first story's title, "The Day Of His Return!" 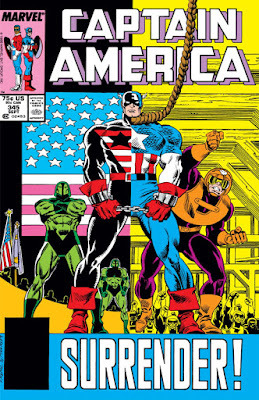 The Murderous Rampage of Captain America! 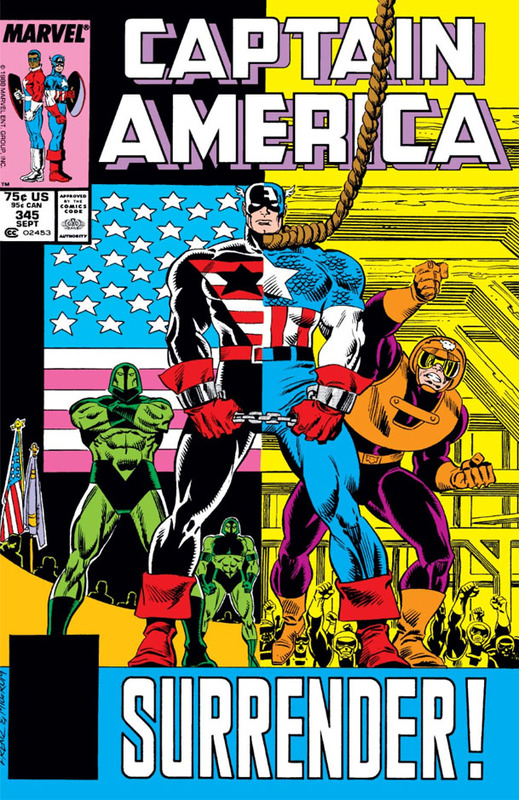 In our look this week at Marvel's composite covers from 1981-'92, we come to two covers of Captain America where one of them doesn't seem to meet our criteria--that of having two distinct stories within the issue that represent the dichotomy of the cover image. Though as we'll discover, it makes something of an attempt to do so. 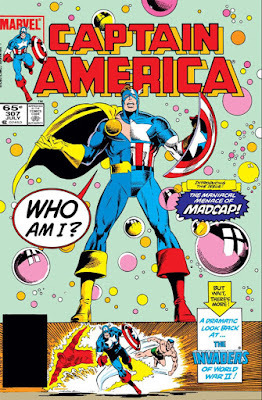 In the case of Nomad, pictured on the earlier Cap cover, his situation is more introspective in nature--trying to determine his own role in life aside from being the partner of Captain America. Nomad, formerly the partner of the Cap of the 1950s, now must come to terms with a world that's advanced decades from the time that he knew, just as Cap had to--and as far as his civilian life, he decides to start from the ground up. 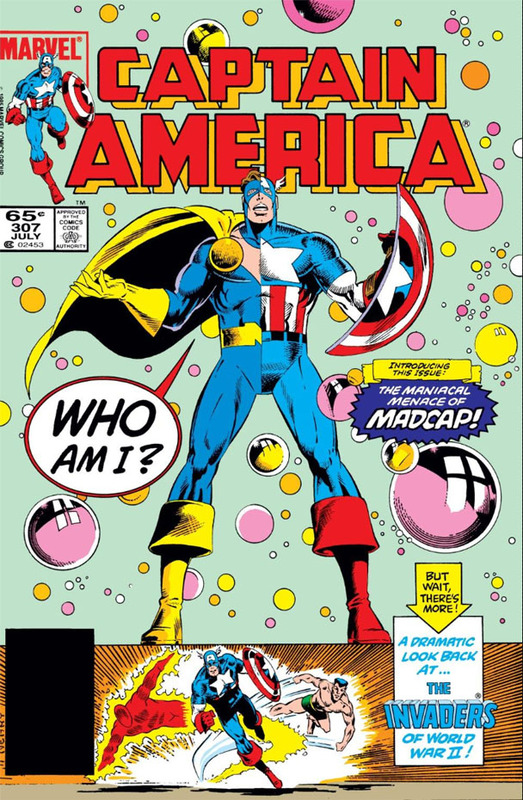 But at the worst possible time for someone coming to grips with a new world, the dangerous villain known as Madcap makes his debut--and his power threatens to bring Nomad's worries about his situation with Cap to the foreground. This week, the PPC will be taking a look at a few issues featuring composite covers--where the cover, like the story inside, is split down the middle and offering the reader a little more bang for their buck. 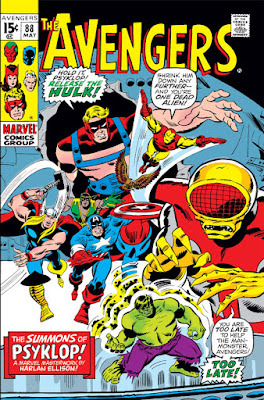 The books we'll be covering range from 1981-1992, though you may find yourself being reminded of Marvel's line of feature titles from the mid-1960s which gave you two stories for the price of one. Both the similarities and the differences are apparent when you line them up together; but it's clear that Marvel, inadvertently or otherwise, had found a way to inject new life into a successful concept from its silver age. This kind of imagery would be used sparingly in the more contemporary books since the characters involved were already established in their own long-running titles, but it shook things up nicely from time to time and no doubt made for a nice surprise on the comics racks (or, for the collectors among us, in our pull stacks). Artist Bob Layton gets this ball rolling with his cover from Invincible Iron Man #144, which features Iron Man wrapping up his conflict with Sunturion (which also introduced the new outer space model of armor). 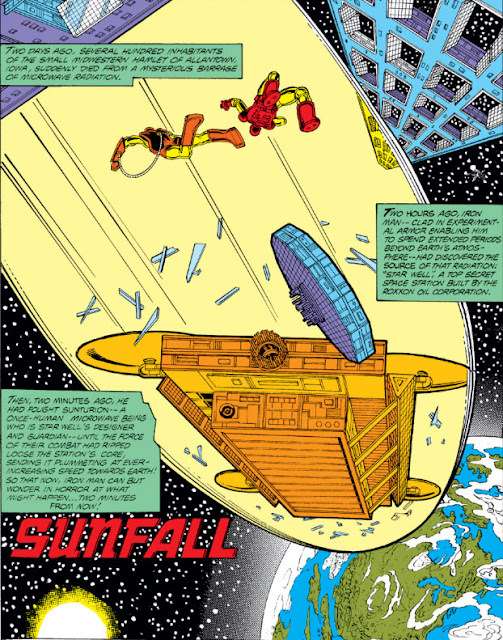 As we'll see, the centerpiece of their battle--the Roxxon Oil space station--has been damaged, its explosive core hurtling to Earth; and Sunturion finds himself in the position of making sure his life's work, meant to benefit mankind (before Roxxon had other ideas for it), isn't instead responsible for the deaths of millions. Our introduction to the mysterious adventurer known as the Shroud came a bit after the fact, considering the man had already made his mark--believing himself to have killed none other than Doctor Doom and, when he discovered his self-adulation had been premature, was more than willing to give it another shot. Created by Steve Englehart and Herb Trimpe as a supporting player in the drama unfolding in the pages of Super-Villain Team-Up between Doom and the Sub-Mariner, the Shroud made his first appearance in the vicinity of the Baxter Building while the Fantastic Four were in the midst of trying to help Namor recover from an attack by Doom designed to rob his special costume of its ability to keep him alive while not in contact with the water which sustained him, as part of a plan that would force Namor to once more become Doom's ally. The Shroud's subsequent encounter with the Human Torch raised more questions than it answered about the man--yet he proved a capable fighter against the Torch, and it seemed clear to both the Torch and ourselves that we hadn't heard the last of him. All we know of his goal so far is that he means to attack Doom for some reason--and whatever intelligence sources he's working with appear to have led him to both Namor and the FF as the likeliest to have had the most recent contact with the armored despot. The Shroud has also demonstrated that his costume is more than a design suited to his name--it's also specially treated with asbestos, as the Torch found out to his detriment. 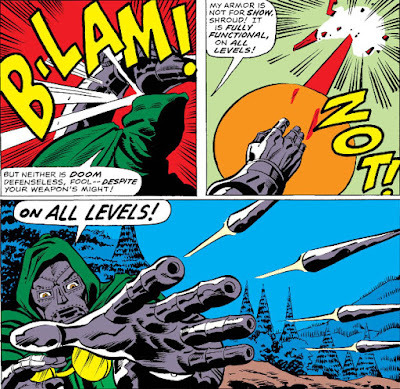 And before you (justifiably) wonder aloud what sort of new costumed character makes a point of fireproofing his clothing, we'll soon discover that the garment is also proof against other kinds of deadly attacks--perhaps done in the name of prudence, when one is expecting to face Doctor Doom. 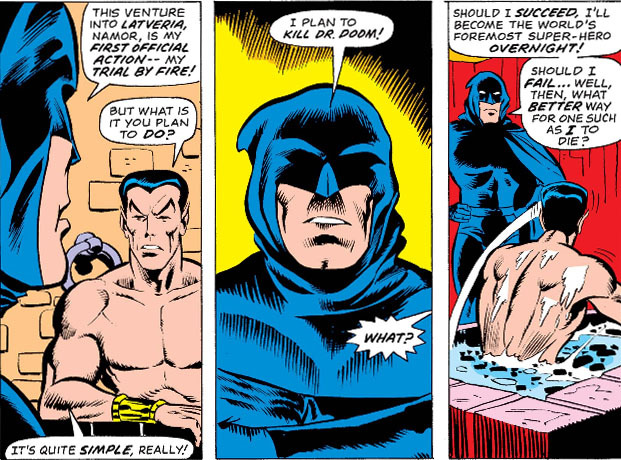 With the FF having failed to counter Doom's sabotage of Namor's suit, Namor was forced to capitulate to Doom, and was captured once he'd left the Baxter Building and then transported to Latveria. And so the FF have gone to Namor's rescue in Doom's storybook kingdom; what they don't realize is that the Shroud is following closely behind. But before we go any further--just who is this 1976 character who stalks in shadows and harbors animosity toward Doom? Let's just say that you'll find the circumstances of his origin... familiar. 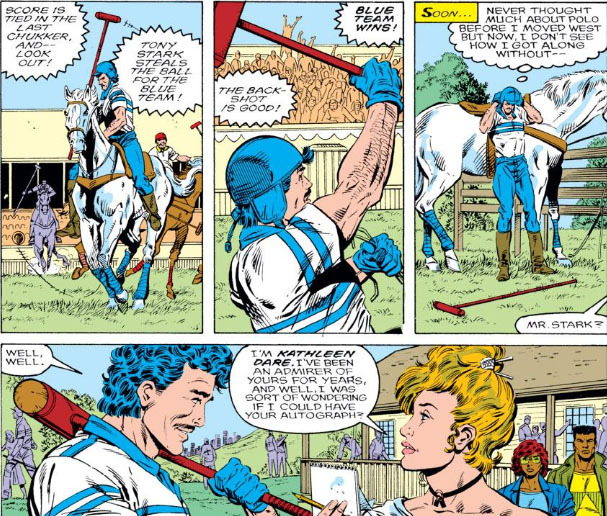 The twist to the Shroud's origin is the "branding" that caused the loss of his eyesight, which, in combination with his supplemental athletic abilities, makes him a variation of Daredevil--in his case, seeing with his "mystic" senses rather than enhanced physical senses. But being a "master scientist," the Shroud brings more science-based resources to the table, as we'll see in a moment. That brings us up to speed on how the Shroud came to be--but it doesn't explain why this man is so obsessed with killing a man he knows only by reputation. 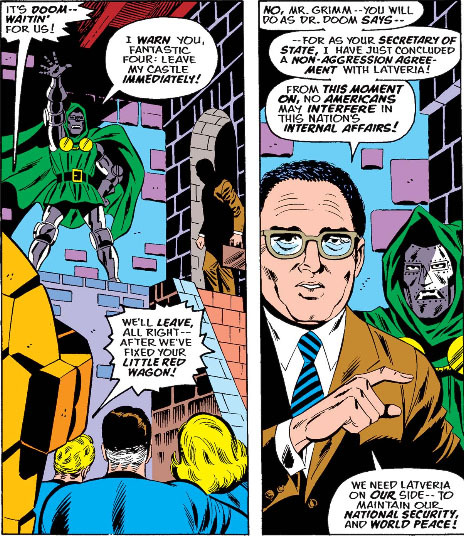 For that answer, we have to follow him to Latveria, where he makes his way to Doom's castle while the FF are engaged with Doom's reception committee. 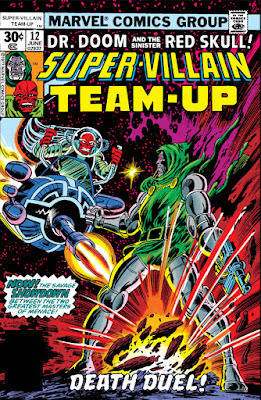 Facilitating the agreement between Doom and the U.S. was the fact that, thanks to Doom's machinations, Latveria is now in an alliance with Atlantis--and though the Atlanteans are currently in the grip of a nerve gas compound that has rendered its population comatose, Atlantis is still ruled by Namor, who now serves Doom. 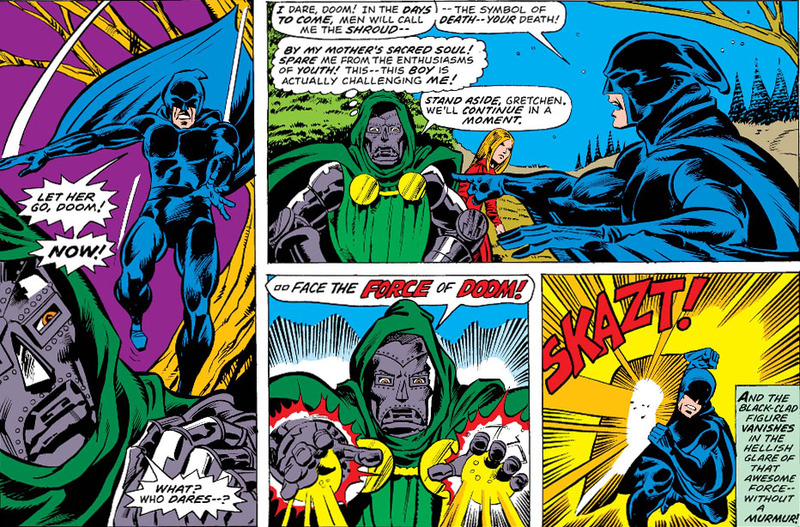 Doom of course is one of the major villains of the world, worthy of a new hero's wish to make a difference; unfortunately, the Shroud's motivation seems to have less to do with altruism or ridding the world of Doom's threat, and more to do with establishing his rep. 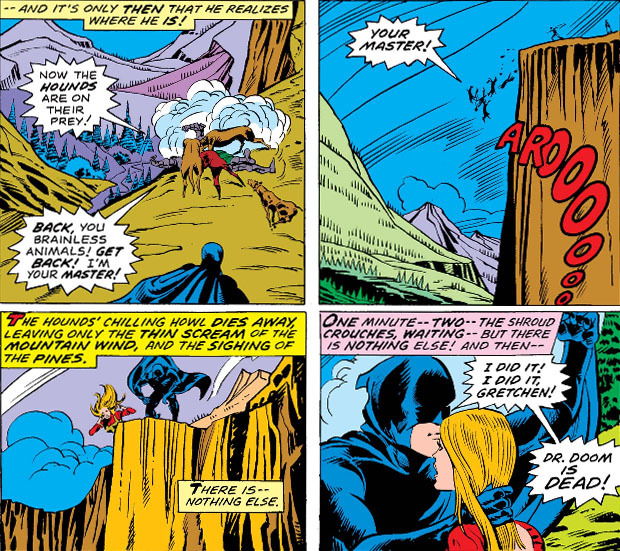 The Shroud receives Namor's cynicism rather than his blessing--but regardless, he proceeds with his plan that night, just as Doom is feeling a bit lonely and decides to take custody of a girl named Gretchen, a daughter of one of the villagers, for her company that evening while he sets his hounds loose to hunt for wolves in the countryside. But before Doom can take advantage of his status over the girl, the Shroud shrikes... er, strikes! 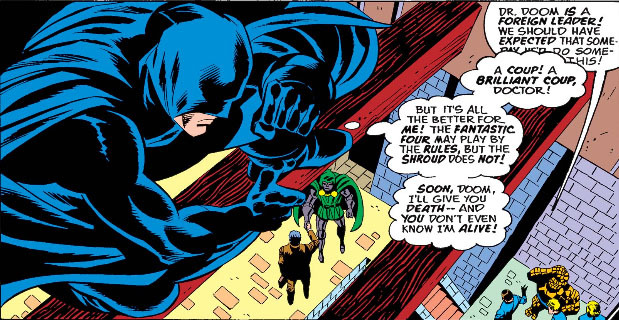 Englehart contrasts the characters' temperaments nicely--the upstart vs. a seasoned menace who regards the Shroud's challenge as incredulous and even insulting. Yet the Shroud has come well-prepared for this face-off--and even Doom would have to admit that the Shroud makes a fight of it. In the process, we learn something else about the Shroud's costume: whoever has sewn its pockets is a genius, considering all of the gadgets and gear he's able to stow in its folds. So far it looks like the Shroud has every reason to be confident, as well as he's staying one step ahead of Doom in this conflict. It might even be fair to say that Doom is on the ropes, with the Shroud's last attack forcing Doom to rid himself of a vital piece of his armor's protection. But the outcome of this contest will have to wait for another time, as a twist of fate removes Doom's threat, seemingly for good. And while the fate of Doom will remain in doubt for the rest of us, the Shroud will end up taking quite a victory lap, riding the wave of his success for all it's worth and announcing at opportune moments that he's "the man who killed Dr. Doom!". Admittedly, it could be considered quite a feather in his shroud cap, under other circumstances--but considering how often Doom manages to have the last laugh, the Shroud may want to hold off on the talk show bookings for now. 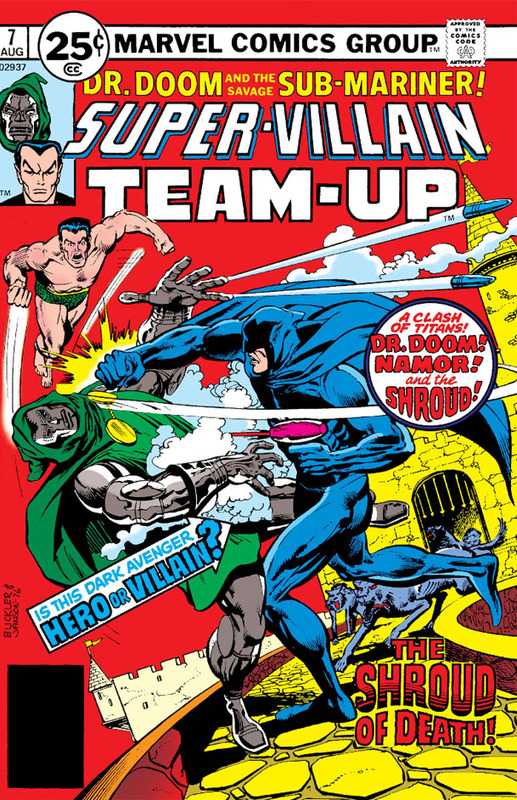 This issue's power-packed cover by Rich Buckler and Klaus Janson! 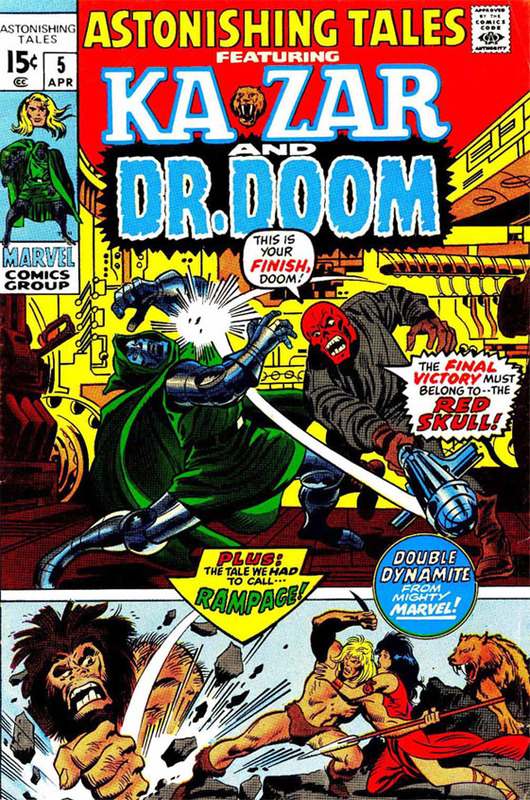 When you're tossing around words like "fiendish" and "diabolical" to describe the Red Skull or Doctor Doom, it's a tough call to make as to which villain could lay the greater claim to those terms. It probably goes without saying that when you put these two men together in the same room, the sheer level of villainy would be off the scale; yet aside from each of them seeking power, Doom and the Skull would seem to have little in common with each other. 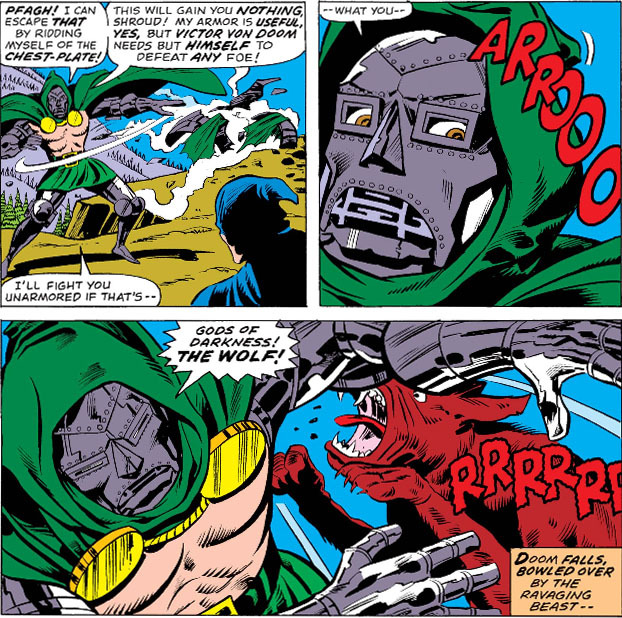 Doom appears to hold the Skull in contempt, in both his character and the man's fanatical obsession with bringing about a Fourth Reich--while the Skull covets Doom's power base and resources, and would arguably be Doom's inferior in regard to a head-to-head contest with one another. That said, we're all familiar enough with the character of each to know that it wouldn't be wise to count either of them out in such a face-off. And though they would each be loathe to admit it, they do share certain characteristics and traits. Both are masters of planning, as well as involving others in their machinations (with or without their knowledge); both are prone to blind rage and cruelty; both have a talent for manipulation; and, certainly, both feel entitled to grind the masses beneath their heel. On the flip side, each has failed in blatant power plays; each has experienced humiliating defeats; each has held ultimate power, only to lose it; and each has a particular enemy that they're unable to crush. So what's their alternative? Would they ever join forces? Consolidate their strengths and present a united front against their enemies? It would seem an exercise in futility, given that neither would likely play the subordinate, and each would constantly suspect the other of betrayal given the opportunity. 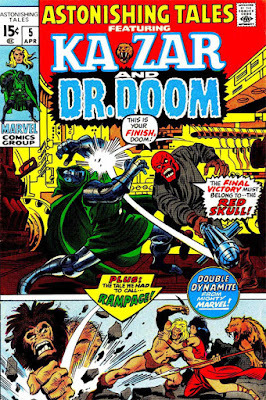 Doom and the Skull were mostly cool to one another during the Acts of Vengeance alliance, with the Skull instead coming into conflict with Magneto--and another alliance on a parallel world, which actually succeeded in wiping out the Earth's heroes, lasted only until their mutual goal had been reached. Each may want power, but they would have different expectations as to their reasons for seeking it out and how they would use it. That would seem to leave them to battling one another, though it might be more sensible for each of them to mind their own business and not become involved in the other's affairs. 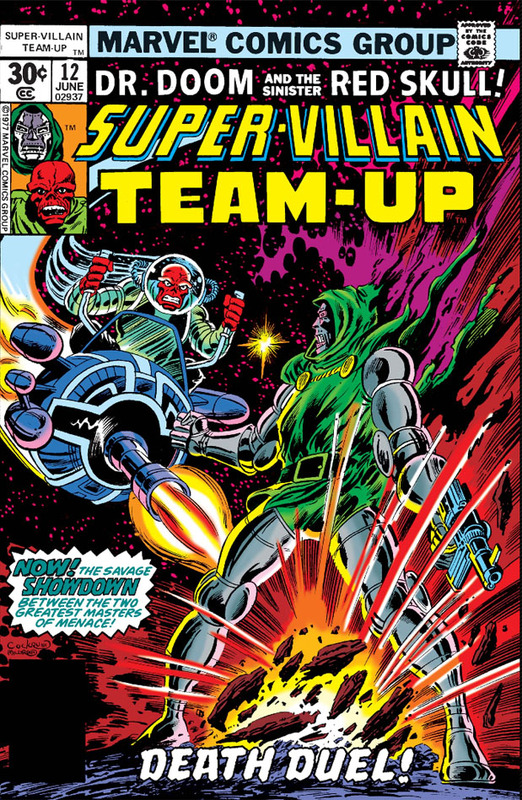 The Skull really has nothing that Doom would want, and probably isn't even a blip on Doom's radar; but in the 1970s, we couldn't say the same for the Skull, who twice usurped Doom's throne in Latveria while Doom was occupied elsewhere. Suffice to say that in each case, Doom was going to make the Skull regret his arrogance.